Think of social media marketing like fitness. You’ve got to make a social media plan based on your goals, which presumably you’ve already done. Maybe you’ve even been working the plan and realizing some gains. Sweet, sweet gains. However, all social media marketing plans should account for potential problems. All social media plans fall into lulls. These are the plateaus when you’re working and working but can’t make the scale change. You’re lifting, but can’t go up in weight. You’re going to yoga class but can’t hold that one pose for longer than a second. And now it’s not fun anymore. What do you do when you don’t want to do anything? Fall back on a schedule when social media marketing feels like drudgery. Don’t make social media marketing something you only do when you have the time, because you won’t feel motivated to make the time when there’s no progress. So, plan your time and work your plan. Motivation Tip: Rely on your schedule when your motivation for a project wanes. You don’t do it because you want to, you do it because it’s on the calendar. You slipped up. Maybe you sent a Tweet that didn’t go over well with your audience. Or you got lambasted for something you said in a blog. Maybe a customer wasn’t happy and got social about it. Or maybe you just got busy and stopped following your plan. How do you manage a setback? Get real. You are a person, not a company. You are doing your best. So, give yourself a break. You’re going to make mistakes. Accept this and pick up where you left off. Apologize if necessary or defend yourself if that’s your position. Whatever you do, get back in the swing of things and carry on. Setback Tip: Setbacks are inevitable in the social world, but no one cares that much about you and your slip up. Rest, regroup, and move forward. Maybe you’re the type who gets on a workout program and suddenly you’re on an all protein diet, you’re in the gym all day and hitting fitness classes at night. You’re studying physiology and anatomy and nutrition. Everything else is falling behind because you’re spending all of your time on your new obsession. If you’ve checked your Facebook / Twitter / email notifications while reading this post, I’m talking to you. How do you manage overkill? 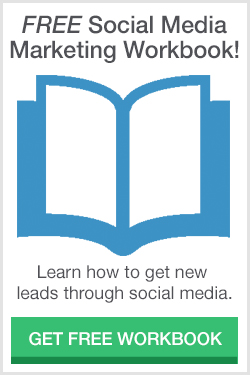 There’s nothing wrong with getting into social media marketing. It’s a good thing that can help your business, but you have to handle the work of your business to have something to promote. So, give yourself limits. For example, only check your feeds and notifications in the morning, in the afternoon, and in the evening. Three times a day is plenty. 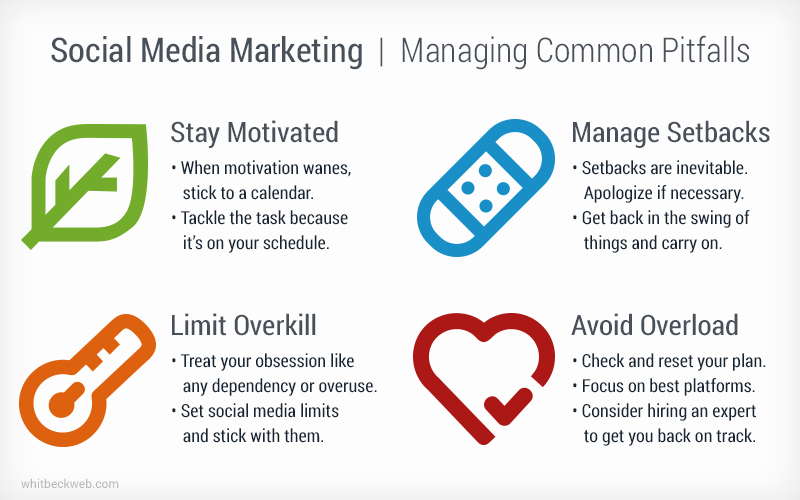 Overkill Tip: Treat your social media obsession like you would any dependency or overuse. Set limits and stick with them. Maybe you’re not sure what you’re doing so your social media plan feels messy. You’re on too many sites and not doing anything well. You’re not sure how any of it works and you’re not getting any positive feedback. You’re inconsistent in some areas and over-reliant on others. You feel frenzied whenever you engage on social media. How to manage overload: Go back to the basics: research, plan, and execute. You dove in and it’s not working. So, you need to reset your plan. Know what platforms your customers use and be sure you know how to engage on those platforms. Overload Tip: This is the opposite problem of overkill. You might need to hire a social media marketing expert to get you on the right track. While your social media marketing goals guide your plan, the execution of your plan will guide your next steps. And here is where fitness and social media marketing part ways. If you want to be fit, you have to lift and stretch and eat right and do cardio and map your progress and make new plans as you go. You might not like it, but it’s the only way to get in shape. In contrast to physical fitness, you can always hire someone else to get your social media marketing into shape. It’s funny, because I leave Twitter, Facebook, and Google+ open all day while I work. It’s a wonder I get anything done. Great tip! Yeah, social media can be a slippery slope. There’s productive activity, and then there is distraction. I guess mine are open too (not Facebook), but I do tend to try to check them at set times. Appreciate your input. To your success! I saved this to read later. Well, later came today, October 24, 2015. I haven’t even read the whole article yet, and I HAD to let you know how much I appreciate it already! I have always loved what you share and have found it to be of great value. THANK YOU! Negin می‌گه:Migam shomaha chera gir dadin be 2khtara? bdaest avardane shomare 2khtare hamsaye ! ya’ani pesara vojood nadaran? akh joon, donya bi pesar shod. pas ma 2khtara hich ghoseei nadarim. Diese TÃ¤ter sind nach ihrem Ableben aus dem Schneider. Sie werden nach dieser Welt nicht mehr bestraft. Und seeelbst wenn, interessiert es alle gerade in dieser Sekunde HÃ¶llenqualen erleidenden Ki/enrnMedschen einen Dreck ! Wach auf ! Sie brauchen JETZT Hilfe und keinen Gottesttrost, welcher dir als Kind auch nur aufgeschwatzt wurde. Wie kann man nur so ignorant sein/bleiben und gerade bei sowas Schrecklichem wieder und wieder inï»¿ religiÃ¶ses Geseiere verfallen?